At this year’s PAX Australia, life imitated art as hundreds of fans walked the halls of Melbourne’s Convention Center dressed as their favourite video game characters. From the carefully hand crafted pieces to the casual costumes, they all came together to experience a range of panels, game showcases, and meet ups with video game enthusiasts from near and far. Although there were many cosplayers representing different games and genres, it was the League of Legends cosplayers that came out in full force.Laura Scott, also known as Saerianne, is a 19 year old cosplayer from Sydney. She attended PAX this year in three different League of Legends champion outfits: Arcade Miss Fortune, Janna, and Lulu. At last year’s convention, Laura says there were close to 20 League of Legends cosplayers but this year there was an increased influx and they came by the hundreds. It was evident at this year’s PAX that the cosplay community is flourishing and a result of this is the rise of the cosplay celebrity. Laura attended a panel where prominent cosplayers Eve Beauregard, Rae Johnston, and Ardella talked about the nature of this new fame. They said that it exists, but that it is different type of celebrity, one that belongs less on a pedestal, and more as an inspiration for those who want to express themselves in a creative way. She began with a Deviant Art page which evolved into a Facebook page. From there different Cosplay groups shared photos which led to increased recognition. Like many other cosplayers, she has her own card to hand out, which has her Facebook details in case people at conventions want to follow her. Despite this, she still isn’t used to the attention it brings. It is this theme of inclusivity that has allowed the cosplay community to develop into what it is today, a thriving force of united passions and creativity. And PAX has given the bonds built through shared photos, tweets, and messages on social media a space to become tangible. 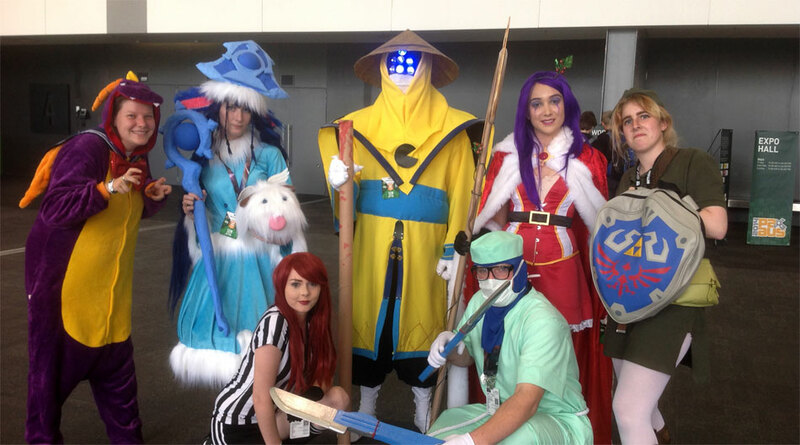 For Laura and others like her, PAX is an open and welcoming convention that has given video game cosplayers of Australia a place to call home. Guest contribution by Jordan Fennell.